Manitoba Prairie Quilters is pleased to offer blocks of learning opportunities for all quilters, Members and non-members, alike. Our hope is to recruit accomplished artisans who also possess the gift of teaching to share their insights with eager students. 2018 and 2019 will prove to present skills, techniques, and innovative ways to add even more flair to your quilt-making. Find the class and time that works for you. Click “Add to Cart” and after you've added all that you want, click on "Go to Cart" and follow the prompts. You’ll be sew amazed you did! Workshops will be held at St. John’s College, University of Manitoba. 92 Dysart Road. Free parking on the premises. All workshops run 9 am to 3:30 pm and are $65 per day for members and $95 per day for non- members. Lunch is included and will be served from 12:00 to 1:00 pm. Prior to March 1, 2019, payments will be refunded less a $20 cancellation fee. No refunds after March 1, 2019. For classes requiring a sewing machine, please also bring extension cord, extra needles, bobbins, accessory box, and instruction manual. A basic sewing kit should include thread in neutral and matching colors, needles, pins, fabric and paper scissors, pencils and other marking tools, seam ripper, ruler. For any classes that require cutting and trimming of fabric, bring a rotary cutter with new blade, cutting mat (18" x 24" recommended) and at least one ruler. A fat quarter of fabric is approximately 18" x 22" in size. Any kit or pattern fees will be collected in class, payable to the instructor by cash or cheque except for the Summer Blossoms workshop which is included in the course fee. Will be supplied upon registration. PLEASE NOTE: CHOOSE ONE WORKSHOP PER DAY ONLY. Click Here to get member pricing. This class embraces the techniques (learned in a class taken in Duluth, MN) of Lola Jenkins – fabric portrait artist. 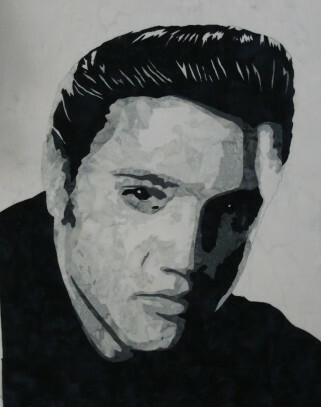 Participants will learn the process of taking a photo and creating a stunning quilted portrait, working from a classic “Elvis” photo to learn the step-by-step process to create artistic portraits of friends, family or pets. Susan Moxley Cote Susan has been sewing for well over 55 years, and has been quilting seriously since 2002. She is a member of Manitoba Prairie Quilters, the Winnipeg Modern Quilt Guild, and does something quilting related everyday. She developed a love for string and scrappy quilting shortly after her stash started talking to her from the shelves in her quilt room! 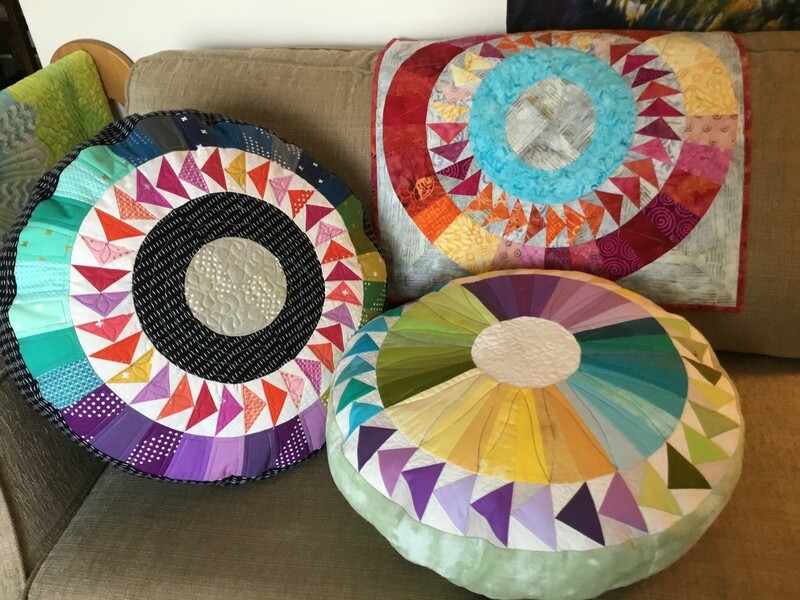 What do you do with the large stash of bits and pieces of a variety of quilting fabrics in a rainbow of colours? String Piece it into a quilt! 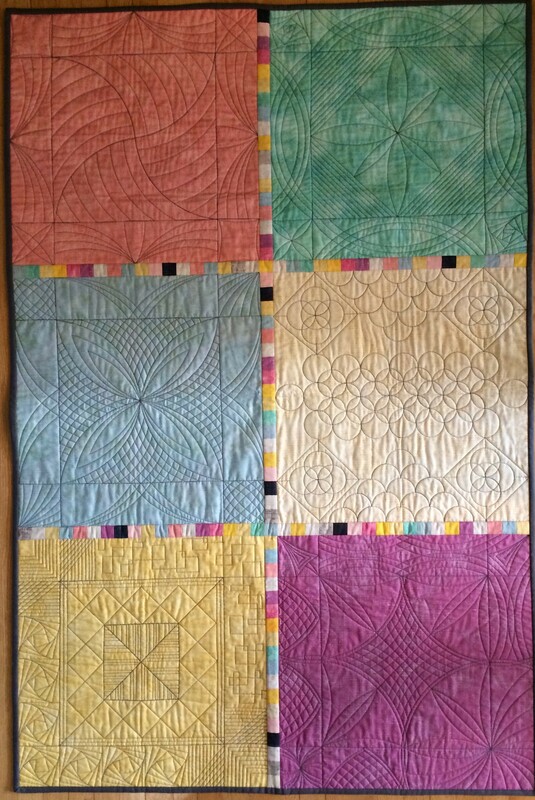 String Piecing is a technique that uses strips or strings of fabric sewn together randomly, without regard to colour, on a base or foundation to make quilt blocks for a quilt. In this class, the next piece of fabric that you pull from your pile, will be the piece you sew on to the last piece of fabric on the foundation. You will be making some string piecing samples that you will take home as a reference to what you learned in the class. I will also have handouts on many other types of string piecing that you can try at home. A large assortment of fabric cut into various widths will be supplied to you for this class. You do not need to bring any fabric with you. Base papers will also be supplied. 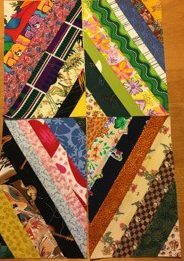 In this class participants will learn to use the rulers they purchased for Ruler-Guided quilting to come up with their own personal quilting designs. By the end of class, participants will have a number of paper designs for blocks, borders and corners. These designs can be left as paper designs for future reference, or can be quilted into a sampler, pillows or a bag. No experience is required. Participants will need to simply bring their own quilting rulers (1-5) and pencil/eraser. The rules can be any brand, any size or shape. Techniques for ruler-guided quilting will be discussed. A small supply fee will be charged to participants. 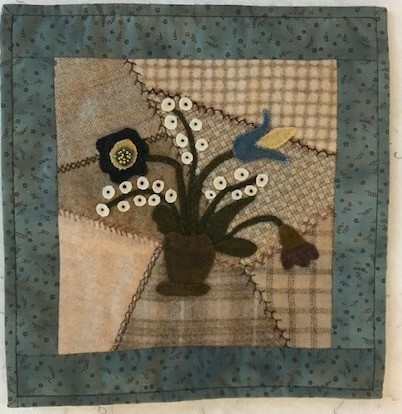 Summer Blossoms – Intro to Working with Wool and Fabric - 16" X 16"
This class is an introduction to working with wool and fabric. It is suitable for all levels of quilters and is a handwork class. Learn to make a crazy patch background and embellish it with embroidery stitches, accent wool work and embellishments. Design your own cushion cover, wall quilt, table runner or even a bag. Completed blocks can be joined together to suit your individual requirement. Kits must be ordered, therefore kit fee is included in the price of the course fee. Kit includes pattern book, wool, muslin, freezer paper and one spool of neutral pearl cotton thread. Do you want to create your own blocks but you are not know sure where to start? 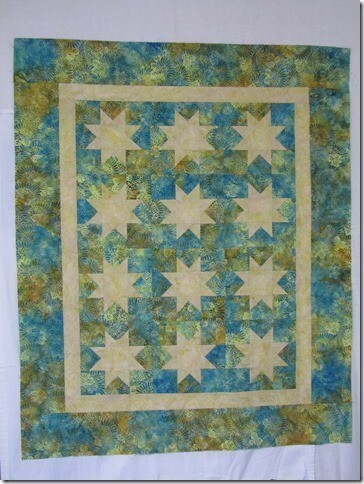 Do you think you have to be an artist to create new designs for your quilts? Well, you don’t have to be anything except willing to learn this technique and you will amaze yourself! We will start this one day class with an overview of the Colour Wheel to get some creativity going. We will then use this as a foundation for creating beautiful original traditional designs. You will learn how to use the unique blending-block and exploding-block design techniques. You will be surprised at how easy it is to create exciting new designs with many of our much-loved traditional patterns. have at least one new design to use in a future quilt. Please note: handout fee for exercises. It’s time to make a quilt for someone and time is of the essence and you want to try something just a bit different than you’ve done before. You don’t want all the star blocks to look exactly alike and it would be nice if the stars would be in different sizes -- so let’s have fun and play around with the star soup pattern. 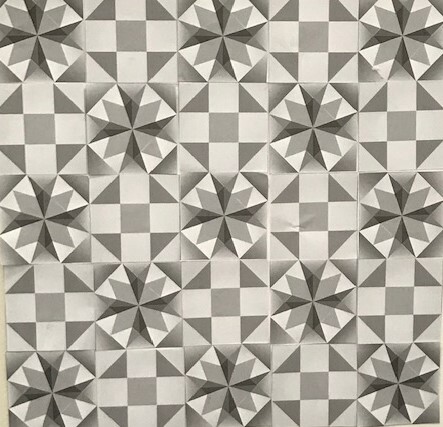 If exact precision isn’t your cup of tea.-- this block is forgiving and especially if you want to change up each star point per block. It’s just plain fun to do!!! This is a great design to piece together with a new quilter or perhaps you want to take this class together with your grandchild or another ‘new’ quilter that you are mentoring. Let’s have fun together and spend a day playing!!! Please Note: There is a Kit Fee. Skill Level: Experienced, but not necessarily advanced. Size: This can be made into a pillow (22"), or a wall hanging/ table center 24" square. Style - traditional: this pattern uses two paper piecing patterns. There will be some hand appliqué and free motion quilting. There is no pattern required. The name of the book will be provided, if participants want to purchase it. Many of us have heard of the “Stitch Bible”. 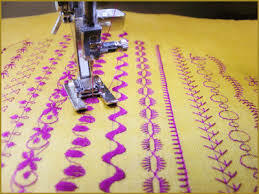 This is one of the best ways of learning the various stitches your machine can produce, and the variations that can be created with those stitches. Truly a great method of understanding, and becoming comfortable with your machine. But we all know that creating this treasure requires a time commitment. Why not give yourself the gift of one day to get started on this special project?